Here we have an easy egg curry for all ages to try! This restaurant style egg curry (Anda Curry) is tasty, healthy and the perfect choice for bachelors who love to explore their cooking skills. If you love eggs, and want an exciting variation from the regular omelette, then prepare this super easy egg recipe. From now on, get the Dhaba flavours right in your kitchen! 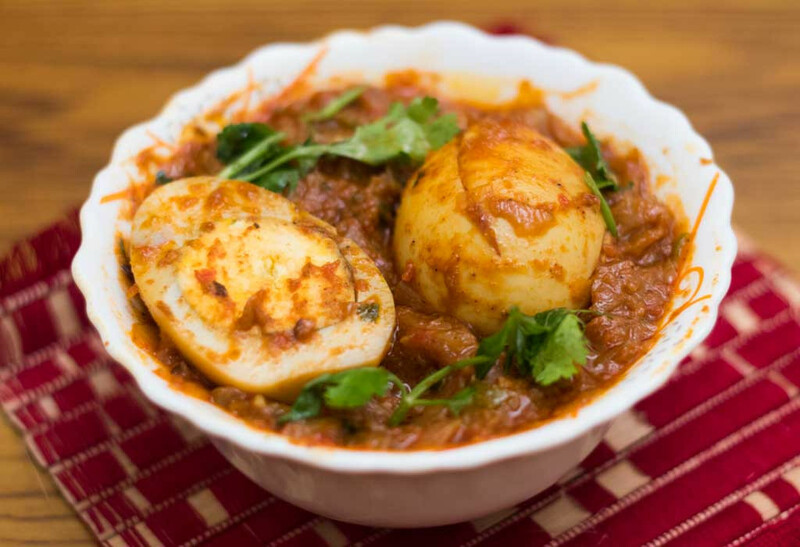 Pair this lightly spiced quick and easy Indian egg curry with roti, soft bread, appams, bhatura, poori or even plain boiled rice and enjoy a comforting meal. Roast the besan flour in a pan on low heat until the raw smell disappears. Once light brown in colour, take off from heat and transfer onto a plate. Peel the boiled eggs from the shells and keep in a bowl. To the boiled eggs, add a pinch of turmeric powder, chilli powder, and salt and coat the eggs with the powders. Prick the eggs lightly to infuse the masala. Heat a pan with half the oil and once hot, add eggs gently and fry until all sides are evenly roasted. Take out the roasted eggs and keep aside in a bowl. Pour the remaining oil in the pan. Once hot, add cumin seeds, chopped onions, and saute for 2-4 minutes. Then add green chilli, ginger paste and garlic paste and saute again until raw smell disappears. Now, add the rest of the chilli powder, turmeric powder, coriander powder, cumin powder, garam masala and stir well. Now add tomato puree and combine well. Cook for 5 minutes with lid on. Add roasted besan powder at this point and mix well. Pour 1/2 cup water and mix well. Let it boil until oil shows up. Add salt at this point. Tip in the boiled and roasted eggs into the masala gravy and coat with masala gently. Boil for 5 minutes covered and then stir again. Finally, add kasuri methi leaves(fenugreek leaves), and coriander leaves and stir gently. Cover and cook at a low flame for about 10 minutes and stir once or twice in between. Serve hot in a bowl and garnish with coriander leaves. Wasn't that quick? You can get meals served in a matter of 30 minutes. This Tasty & Easy Egg Curry Recipe will deal with your hunger pangs in a healthy way. Try it! Here we have used chicken eggs for the easy to make egg curry, but you can also duck eggs and quail eggs for the same recipe. Also, a dollop of fresh cream will make the dish all the more richer.